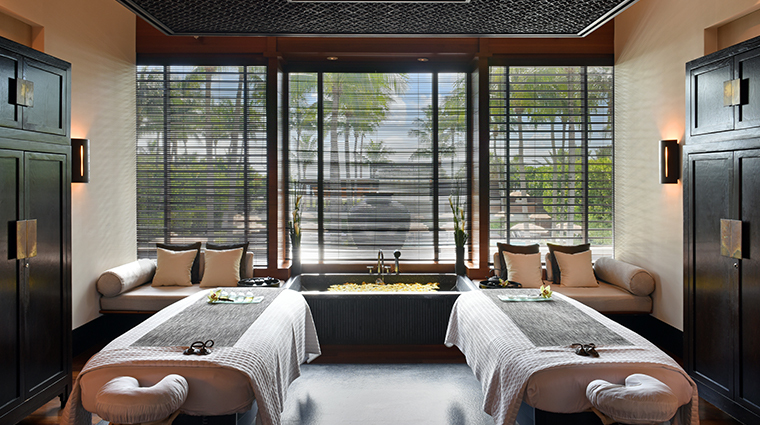 Asian simplicity and elegance are the inspiration for The Spa at The Setai, a tranquil Forbes Travel Guide Four-Star oceanfront retreat. Surrounded by lush gardens and views of the Atlantic Ocean, the dreamy spa takes its design cues from Southeast Asia, with streamlined, rich wood furnishings and neutral hues. Four treatment suites feature private steam rooms and showers for quiet relaxation before or after treatments. The Balinese massage is a deep-pressure technique that relieves muscular tension and stimulates the lymphatic system. Or try the Langkawi Bamboo Body Polish, during which tiny rejuvenating pearls of bamboo and ginseng are used to invigorate the body and mind and improve circulation. • The philosophy at The Spa at The Setai is derived from an ancient Sanskrit legend of the gods, who embarked on a quest for a natural elixir for immortality and eternal youth. • Inside, natural light filters in the large windows, which gives you a view of the gorgeous palm trees and the Atlantic Ocean. • The traditional treatments are a bit on the longer side and incorporate the healing techniques of Bali, India and Tibet. • Bathing ceremonies and massage services from are available in your hotel suite.The ideal rooms to enjoy an in-room service are the Spa Studio Suites, which feature the same tub layout as the treatment rooms — a tub built into the wall facing the beach. • If you enjoyed the products used throughout your treatment, be sure to pick up a few items to take home from the spa shop located near the entrance of the serene building. 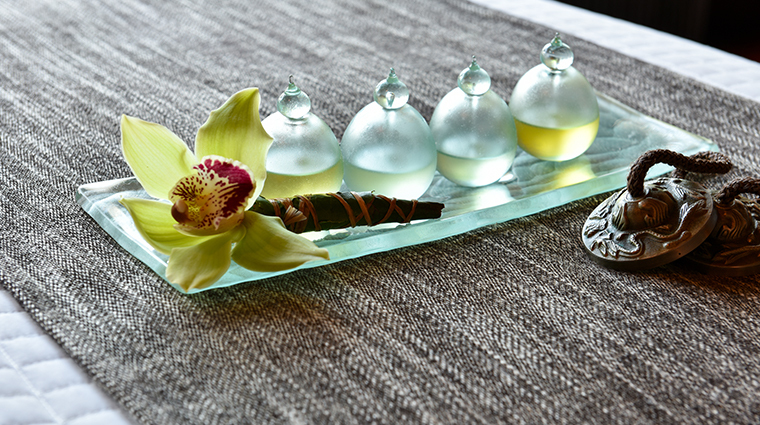 This serves at your Setai souvenir and reminder of your Miami spa experience. • Calling the spa directly might be old-fashioned, but it’s also the quickest way to secure an appointment. • With just four treatment rooms at the intimate spa, therapist and facility availability can become limited. If you show up hoping for a last-minute appointment, you might leave disappointed since they are not always available. • There’s no need to call weeks or months in advance; just a few days notice should do. We called the luxury spa on a Tuesday and got in for a Friday morning that same week. • The cancellation policy is more generous than most in Miami — and even at spas of this caliber around the country. If for some reason you can’t make your appointment, all you have to do is call the upscale spa within six hours of your scheduled treatment time. • While there is no official cell phone policy printed listed on menu, you should probably turn off your cell phone before walking into the doors. • Treatments and rituals here are based on holistic principles of aromatherapy, Ayurveda and herbalism, combining ancient wisdom with modern expertise. • The Setai Oriental Ritual includes an aromatherapy foot polish, a massage, an organic facial, an Asian-style foot massage, a Himalayan crystal body polish and an Oriental bathing ceremony. You’ll undergo a full-body treatment in less than three hours. • REN Guerande Salt Exfoliating Body Balm for Delicate Skin exfoliates the skin with French mineral sea salt (combined with basil, peppermint, olive and almond oils). Post polish, hot towels are used to wipe away the balm and soak in the oils. Then, a rose body cream is applied. • Indulge in the Organic Naturelle D’Orient Facial, which begins with a cleanse and exfoliation. It also includes a steam and massage and is topped off with a regenerative masque. The service concludes with an anti-aging moisturizing cream. • Designed as a bathing ritual for two in the deluxe double spa suites, the Setai Love Bath Ceremony includes a love potion, rose petals, champagne and canapés. Anniversary gift, anyone? • The wet areas include a steam room and sauna. In the locker rooms, you’ll find separate bathrooms and showers, which help to complete the space. • There’s nothing better than relaxing in one of these large tubs that is built into the wall of the spa. They overlook the Miami beach that’s just outside and can be found in the four spacious treatment rooms. • The fitness center has all of the latest equipment — in fact, the gym was completely updated in 2012 and is decked out with brand new Life Fitness equipment, weights and wood floors. • What this spa lacks in elaborate relaxation room space, it makes up for in private space within the four treatment suites upstairs. It’s in those areas where you’ll find breathtaking views of the Setai’s lush surroundings.